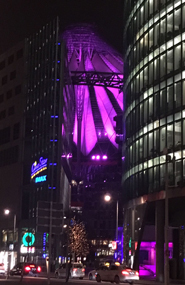 I have just returned from a 3 night stay in Berlin, due to the flight times we really just had two full days so only scratched the surface of what you can do and see. A quick way to orientate yourself with the City is one of the open top buses on offer, it is about 2 hours to go all the way around dependent on traffic but you can hop on and off at points of interest. There was a good range of food options for breakfast which was served in Facil the fine dining restaurant and you could order eggs etc if you wanted to eat something warm. Facil is a Michelin Star restaurant so we went there for dinner one night. 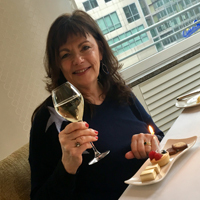 I have to say it was such an amazing meal ,one of the best I have ever had anywhere in the world.Such wonderful flavours and a real mixture of dishes with very discreet service, I was even given a stool to put my handbag on! 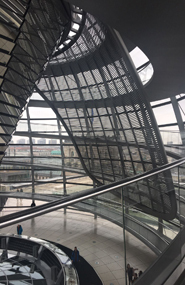 We managed to book to slot to go to the Bundestag which is the equivalent to our houses of Parliament, we walked right to the top of the glass domed Reichstag. From there you get amazing views around the city and with the Audio guide you can see the points of interest. They have a restaurant there where we had a nice lunch. Subject to availability you can book to go into the viewers gallery during the parliamentary sessions. We visited the Jewish Museum which was fascinating, it is made up of two parts plus the gardens. Both interesting and moving in parts, the old building housed “Welcome to Jerusalem.” I could of spent hours there as interactive pictures and videos which worked well with the Audio guide which I would definitely recommend. The Libeskind Building has different areas you walk through. 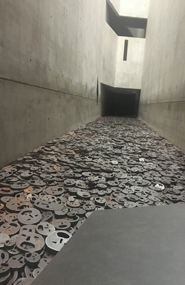 The installation called Fallen Leaves is dedicated to the victims of the Holocaust, it consists of 10,000 heavy iron plates cut to resemble faces is very thought provoking. If you like to shop the choice is huge, big shopping malls plus if you get out of the main city into the small neighbourhoods there are a lot of independent boutiques and buzzing markets. 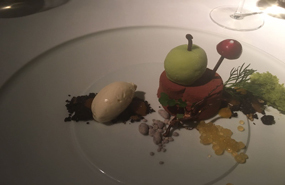 There is an endless choice of restaurants and bars to suit all tastes and budgets, we had another delicious meal at Ristorante Essenza which was just a short distance from our hotel. There is a wide choice of Museums, there is an area called Museum Island & Alexanderplatz which we didn’t have time to go to. There is the TV Tower the highest tower in Germany where you can have lunch. We went to Panorampunkt, which has a lift that whizzes you up 24 floors in 8 seconds! Here you have views all over the city but with photo information on the walls all about the history of the city and that area. As we walked around we come across Checkpoint Charlie, Topographie Des Terrors is the where the Gestapo and SS Central command were based with some of the Berlin Wall outside, Brandenburg Gate, the Holocaust Memorial. The museums we saw were either free of a very small charge which I thought was good. The architecture is fabulous and there is a lot of construction still going on. All the talk of museums and Nazis might make you think it is a glum place to go, far from it Berlin is one of Europe’s party capitals. With a huge choice of Cocktail bars, craft beer pubs , clubs which probably open when I am fast asleep !!! We could of just done with a few more days to see a bit more, one for the must go back to list …..